With this wrap up comes the realization that Paul and I actually completed one of our life goals: a massive road trip. There were hiccups along the way but we enjoyed every moment of being on the road. So much that we’re already discussing the possibility of one from San Diego to Florida. I wish I had taken more photos but when compiling the posts it was difficult nailing it down to a few – and even then, there were still a lot of photos. I also wanted to mention funny moments like when a couple in Maine stalked us because of our license plate (they were planning to move to San Diego the following year). But I fear mentioning things one of many moments that will make the others less significant. 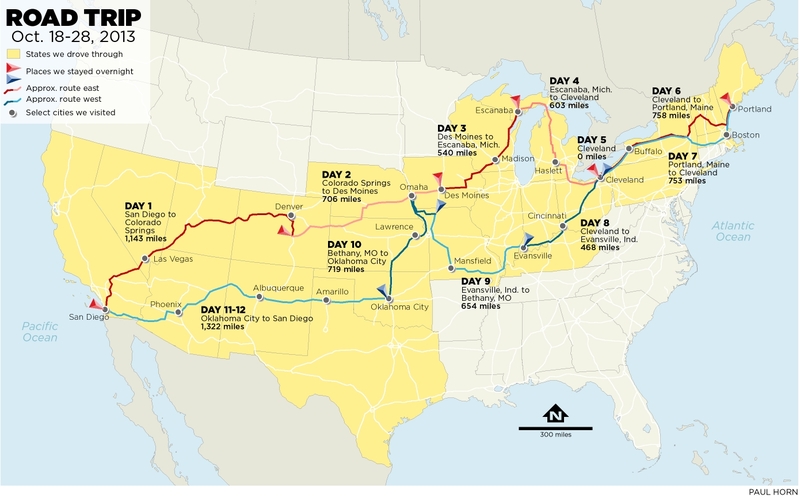 Here are some interesting numbers about our 12-day cross country trip. Number of states visited: 24. Total put on the rental car: 8,000 miles. Total hours Darlene drove: Less than 6. Maximum number of time zones crossed in one day: 3. Most expensive gas: San Diego ($3.59). Least expensive gas: Oklahoma City ($2.89). Number of long pants Paul packed: 2. Number of shorts Paul packed: 8. Number of toll roads we didn’t pay: 2. Number of hitchhikers seen: 5. Number of times the dog barfed: 1. Number of times someone experienced food poisoning: 1. Number of hours we went without showering: 36+. Most frequent roadkill spotted: Raccoons followed by deer. Thanks for reading about our trip. I hope that if you enjoyed it that you get to go on one soon! Very nice wrap-up, I liked seeing your map & stats! Makes me want to go on a road trip, too! It’s so doable! I hope you get to go on one soon. @fayesfork @Caninecologne Haha! I’m a very wimpy driver. We discovered that I do better in city conditions than the wide open country road. The only states I drove in was California, Wisconsin (when it started to rain hard I handed it back to Paul) and Arizona. Congratulations on completing that life goal! I’ve been following along with each post, and it looked like such a fun trip! Thanks! Another life goal is to have Jon Hamm fall madly in love with me but I don’t have my hopes pinned on it. I liked all the “Welcome to …” photos. It was fun reading about your trip. The longest road trip I’ve ever been on was from Northern California to Houston. I’ve never been to Houston but it sounds equally as challenging. We attempted to get as many “Welcome to…” signs as possible and there was some we unfortunately missed and it was my job take them too! Well, Los Angeles to Sacramento is like driving through Kansas so I think you’re pretty much prepared for most of the U.S.
this was absolutely awesome to read! thank you so much for documenting something im sure a lot of us would LOVE to do! Thanks Morgan. When we first started talking about it, we wanted to document it for ourselves and for others that want to do the same thing. I hope you have an opportunity for a similar trip in the future! What a great adventure! If you do decide to make a trip to Florida you better look me up! Haha! I will. It might take a while (although my husband thinks we can make it to Florida in two day), I’ll put it on my list. Will I see you in San Diego this summer?